Emanuel vows to fix Red Line immediately, if elected Reviewed by Edgeville Buzz on January 25, 2011 . We found this article interesting, if not ironic considering today is Edgewater’s CTA Red Line scoping meeting and Emanuel was kicked off the ballot yesterday. According to the Chicago Tribune’s “Getting Around,” mayoral candidate and race front-runner Rahm Emanual has pledged to make rebuilding crumbling parts of the CTA at top priority. 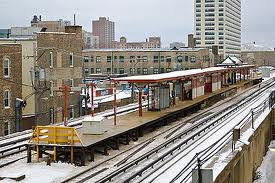 He’s vowed an amitious goal of begining three upgrades to the Red Line in his first year of office, if elected: overhauling 10 miles of track on the South Side, extending the Red Line from 95th to 103rd Street, and renovating the track and stations north of Belmont. Together, the projects could cost as much as $6 billion, which Emanual plans to rely on federal funding for. What do you think – realistic goals, too ambitious, or empty promises?